Welcome back to Behind the Spells, the series that provides a historical background, secret effects, and related material to one of the classic spells of the world’s most famous fantasy roleplaying game. The rules (presented after the “Spell Secret” header) are compatible with any 3.5/OGL fantasy game while the background incorporates the spell into lore of the game’s previous three editions and provides story ideas for the GM. An ancient gold dragon named Maxolt Alberiim is our narrator. Actually, Maxolt is the name of the human fighter-mage the wyrm wears as a disguise when he travels the land, but HTML won’t display Draconic characters properly. Now, this was in an early time, when the secret of becoming a lich were known only to those few beings who had achieved that perverted existence. Hedirac had considered lichdom but ultimately decided that, despite the powers a connection to the Negative Energy Plane would grant, becoming a creature of undeath was a poor tradeoff for humanity’s carnal pleasures. Instead, the wizard turned his efforts to the Continuum—the plane of Time—to find the secret of immortality. To control time itself, Hedirac reasoned, would give him not only what he wanted but would also open a whole new field of magic. The wicked man should have realized there was a reason few spellcasters ever tamper with temporal magics. Although it yields great power, such magic often comes at great peril. But what was peril to Hedirac, who was known to carelessly sacrifice life, property, and ethics in his quest for power? Hedirac studied and experimented with time theories for years before he felt confident enough to actually open a conduit to the Continuum itself. The wizard hoped to harness the raw power of time into a specially prepared amulet which would then, among other things, make him immune to the effects of aging. Or at least that is what is supposed to have happened. The story of Hedirac comes to us from one of his longest-lived servants, a duergar named Kurac. Before opening the portal to the Plane of Time, Hedirac sent Kurac out of his underground laboratory. The gray dwarf thought this an uncharacteristic gesture of kindness but the human simply wanted no distractions. It was this fortunate timing which not only saved Kurac’s life but also gave us the spell time stop. Confused? Let me explain. During his years of research, Hedirac maintained countless notes of his activities. Whether his theories and experiments furthered his immortality goal or not, the human kept the observations within notebooks scattered about the lab. When Hedirac sent Kurac away, the dwarf snatched up one of these notebooks to see if it contained anything he might profit from. The dwarf did this when he could and had before sold the opportunity to study the notes for a brief time to a wealthy mage in a nearby city. Hedirac did not miss the absence of a notebook and Kurac would always ensure that the item be returned within a day or two. After an hour had passed without word from his master, Kurac returned to the lab and tentatively knocked on the door. When there was no response, the dwarf decided to take a quick peek despite the threat of bodily harm which had accompanied previous peeks. Kurac was prepared for anything…except the sight that greeted him. There was nothing beyond the door. No wizard. No lab. No room! An empty hemisphere within stone now occupied the space where Hedirac’s lab had been. Kurac’s initial disappointment turned to anger when he realized that there were but a few brief pages of notes within his stolen notebook. Despite this, the dwarf sold the notes (at a modest price) to his human contact and never retuned to Hedirac’s lair. The human who bought the notebook realized that, while the spell described was beyond his current ability, the description of its time stopping power would fetch a handsome price from his own arcane contacts. Thus was time stop introduced to the world through one man’s indifferent scribblings and a gray dwarf’s greed. No one is certain, of course, what became of Hedirac. Personally, I believe the wizard and his lab were sucked into the Continuum in their entirety. The man is likely doomed to travel through time like a ship on the ocean, never finding port as he and his lab shift through eternity. There are a few mentions of someone matching his description at different points in history so perhaps he found the longevity he so desired. When one compares the original time stop spell with today’s version, one notes certain discrepancies. 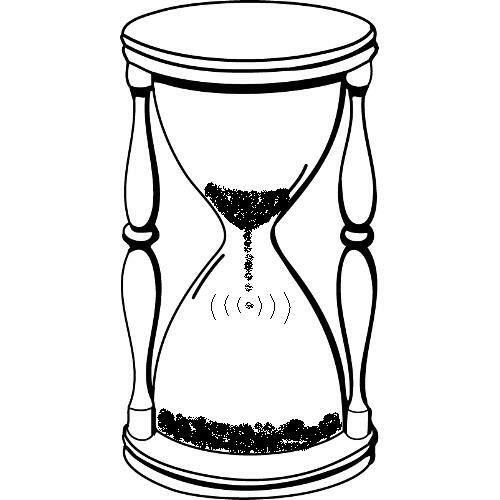 Instead of slowing a bubble of time, the spell now speeds up time for the caster. There were drawbacks to the original as well. The caster could not leave the time bubble so the spell did not work as an escape measure (not to mention the very brief duration of the stop). But the one drawback that none but the most learned of mages knows is that the old time stop produced a fair bit of destruction to the land nearby. It really is no wonder that the spell comes from the mind of a morally-challenged wizard like Hedirac. The original time stop punches a hole through the planar fabric separating the Prime Material Plane from the Continuum. Unfortunately, when the spell ends it leaves planar integrity somewhat a mess. From that time onward, the 30-foot sphere created by time stop is prone to intermittent leaks of temporal energy from the Continuum. When later spellcasters discovered this “oversight” in Hedirac’s notes, they fashioned the safer version of the spell you know today. There are, however, literally hundreds of temporally active areas in Hedirac’s old lands, and they inspired the spell secret below. With a difficult Spellcraft check (DC 34), you can alter time stop to shatter the normal flow of time within a 30-foot radius around you for 1d4+1 rounds. Roll 1d8 and consult the table below for each creature within the area of effect and roll for them every round they remain inside it. Magical results have a duration of 1d6+1 rounds while any aging results are permanent. All effects are cumulative for their durations. You are immune to the distorted time effects. The area of effect is stationary so you are free to move away as desired without dragging the field with you. When spellcasters meddle with time, the consequences are usually bad. But when approached on a smaller scale, magics that manipulate time are safe and beneficial. Take, for example, the spell instill proficiency below. Developed by a sorcerer who lamented never training with a blade, this spell temporarily bestows training with a chosen weapon. The training is of the basic sort provided to the most novice warrior. In effect, the magic literally sends knowledge to the target’s past self as if he had trained with the weapon. At the end of the spell’s duration, the target simply forgets how to use the weapon as if he had forgotten the lyrics to a song. The target gains proficiency with a single weapon that is held in his hand at the time of casting. This spell grants no special bonus with the weapon but allows the target to ignore the -4 nonproficiency penalty while using it. Behind the Spells: Time Stop is the third in a series produced for KoboldQuarterly.com by Tricky Owlbear Publishing, Inc.